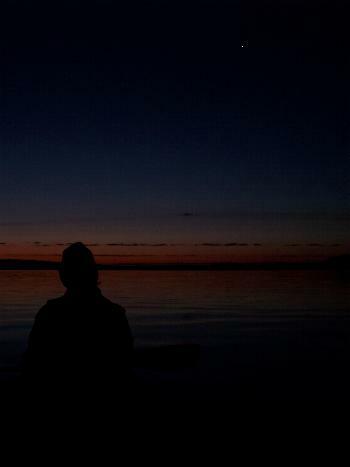 The North Country cannot be fully experienced until it is witnessed in the wee hours of the morning. It is during this time that its true serenity and beauty, and all the other things that it has to offer present itself. 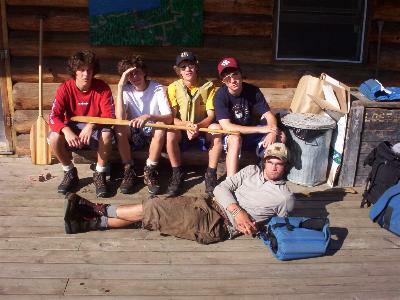 Working as a wilderness guide in the area for an entire summer demands a great deal of originality and spontaneity, in order to refrain from dulling the mind into submission of a systematic routine. To change routes, campsites and entry points sometimes cannot cure this trance, so this is where the idea of a night paddle becomes apart of the itinerary. The first time I decided to try a paddle at night, I decided to bring it up with a rambunctious group of boys going on a 6 day trip. At first they didn’t really listen, as most of their attention was preoccupied with the 14 year old girls that they were flirting with around them. I waited until later when their attention was more on the trip and brought up the idea again. They all responded cheerfully exclaiming they were up for whatever, I then took out the maps and begin to decide what lake we would traverse in total darkness. I decided our best option was to choose a long lake that was easily navigable, and one I was somewhat familiar of. A lake such as Sagnaga which is near 20 miles in length would be great if it weren’t for the many unmarked islands and numerous bays. I chose Gunflint Lake as to be our best option due to its length, and my familiarity with its shores. After a late start out of Sagnaga and a full day of the granite river and its many portages, we were disappointed to find campsites on our target lake, Clove, to be all taken up, so we pushed on and found a campsite after Pine Portage luckily. We ate our dinner of quesadillas and climbed into our tent at 10:00 pm. I set my watch and went to sleep contemplating what would be ahead in the morning. The alarm sounded and I awoke somewhat rested. I rattled the boys and they responded with grunts and groans of their tiredness and exhaustion. We got packed up quite efficiently much to my surprise, and shoved off in our canoes at 1:30 am. The moon and stars distributed a tremendous amount of light that evening, due almost entirely to the fact the moon was a touch more than half crescent. After studying the map I noticed two portages marked between ourselves and Gunflint Lake. One of the other guides from camp warned me saying the portages were a bit tricky to say the least, and we should be very careful. The first spot there was suppose to be a portage I couldn’t find it due to the lack of light at 1:40 in the morning, so we opted to pulling the canoes up the fast moving water instead. We climbed into our canoes again, and after a little ways I pointed out some constellations and also how still and silent it was to the boys, they were excited and inquisitive the whole time. One the boy, who was from Colorado, had never seen a shooting star before, so I told him to keep his eyes open and sure enough he would see one. We paddled a ways and finally came to a falls that had to be portaged. I looked on the map and it showed a portage to the right, so I got out and searched valiantly for it and found something that appeared to be a trail. 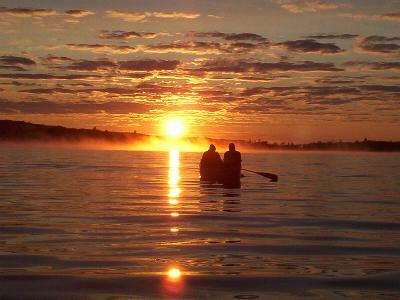 I took my canoe through it first, with one of the boys behind me with a Duluth pack. With a mag light in my mouth, I finally fought my way through the woods to a place above the falls adequate enough to launch our canoes. I slide my canoe in the calm pool and had the boy place his pack into the canoe, and hold it while I went back for the others. As I was walking back I begin to come to the realization that I rather not risk one of the boys twisting his ankle carrying the other canoe across the portage or dropping our wood canvas canoe, so I opted to carry the other canoe as well. Now all were across the portage so we loaded into our canoes and shoved off. 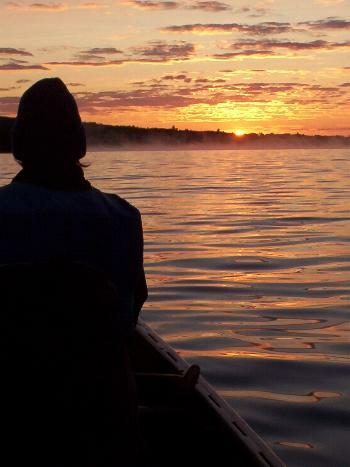 As we glided over the water into the greater expanse of the bay, it became evident to myself as well as the boys of how frigid it can become in the early mornings in the canoe country. I kept the boys moving and had them dig out their raingear to facilitate some extra warmth. Due to some poor decisions that we had made some of the boys had worn pants during our river forging and now were left wet and shivering in their sodden clothing. Even I felt the bite of the August air and wondered why I had not had everyone be more prepared for it. Now onto one of the larger bays on Gunflint Lake, we are passing by the island with the three ginger bread houses it, and are gliding silently and effortlessly by towards the channel that brings us onto the main expanse of the lake. I had everyone stop once we got onto the lake so that we could just float along and experience the calmness, and beauty that was before us. After a moment which seemed to me could have lasted much longer we then dipped our paddles in unison and pressed on. Through the channel now out on the lake, the duffer in my canoe started to complain of being cold, so I had the other canoe come over and gunnel up so that he could switch out and paddle and get moving again. I was starting to worry a bit but after five minutes of paddling he was in full spirits again. After many breaks to switch out the duffer, and also to gaze upon gunflint lodge’s lights along their dock, we began to see some light penetrating the sky to the northeast. It was four in the morning and our bones were chilled and our muscles were tired from the previous days paddle, but that soon becomes unnoticeable compared to what is about to take place. As our paddles wave and dip in unison, the sun seems to move at a staggered pace etching it self closer and closer to breaking free of the horizon. We are moving stealth like and effortlessly across the glasslike surface of this great lake. I look down to my right and see the ripples from my paddle shake the reflection of the moon and what was left of the stars in the sky. These are the instances that I become truly grateful to have the opportunity to be in this place, and to experience a place so one of a kind and pristine. Now half way down the lake with the far eastern end in view, I can see fog resting in the bays in valleys and cannot help but to smile due to how picturesque it is at that moment. Now the Sun’s rays are starting to show some of the silhouettes of a few of the clouds that are across the sky. A few cumulous clouds backed up by lines of stratus clouds depict a beautiful scene before us. The stars have now totally disappeared and I sit in the stern of the canoe watching the many pigments and colors grow wildly across the sky. We watch as the iridescent glow of the sun and its warmth climb slowly and steadily from behind the eastern shore. The fog begins to swirl and float as the sun’s rays start to invade on its sanctuary; it is truly a sight to see. The boys in the other canoe are now ahead of us by 100 yards, and seem to have positioned themselves much in a way an artist would have painted them. 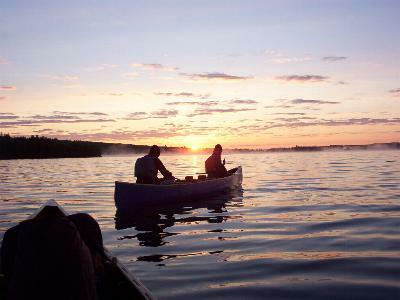 Both paddles resting across the gunnels of the canoe, and positioned so that the sun presented itself exactly in the center. Truly a picture that would make a person want to come and experience this beautiful place as well. The orange circle now seeming to be moving much faster than before, is declaring itself as being one of god’s most amazing creations. A full spectrum of oranges, reds, and yellows are now taking over the eastern sky. The clouds are filtering out much of the strength of the sun, but still remains to let some much welcomed warmth through. Now fully above the horizon and making its way behind the sporadic placement of the clouds, I ask the boys if they have ever seen a sunrise before, which all but one replied no. I think to myself a moment and let my surroundings sink in, and decide that very few people have in fact taken the time to search out a sight as beautiful and as one of a kind as this. The lake, its bays and islands, the canoes caressing the water as it glides through the fog, the loons excited calls echoing throughout the many valleys and of the many cliffs. It truly is something that you have to seek out at some point in a person’s life, to truly put into perspective what really is important and real in this world. I know now that these boys are looking around and taking this and putting it away somewhere deep inside their heads of how extremely influential it is in teaching them of what a true reverence for the wilderness is. How from this moment on they will posses an experience which sets them apart from many of their friends, family or acquaintances they have back home in the twin cities. Trying to explain this true showing of nature in words won’t come easily, and will never be as impactful as actually being there to experience it first hand. The sun has now broken free of the clouds grasp and beats down on us happily and full of vigor. Now I set my eyes on the map to find us a place to rest our tired and cold bodies. Much to our luck an island that was 300 yards away has a campsite to which seemed very ideal. We paddled over and didn’t find a forest service grate, which is the infamous marker for a legal campsite in the boundary waters. I decided the boys were much too cold and weary to find another, so we unloaded and quickly got our dry cloths out and slide into our sleeping bags. Now it is five in the morning, and my plan was to just sleep for part of the morning and then get up around noon and press on to our campsite for the night. I can hear the boys around me shivering and decide to get up and make sure they are all doing ok, and decide to brew some tea and hot cocoa for them. They responded cheerfully and are happy to be there in their sleeping bags warming back up. After the tea and cocoa was dispersed I climbed back into my bag and fell asleep rather quickly, and got there feeling very glad and thankful for the morning’s adventure and beauty.